I wish you a truly blessed and wonderful day. Thank you for reading this blog, connecting with me, and for just being you. You are truly a gift. Would You Spend $5 for a Healthier You? Need some extra help to get out of the habit of putting yourself on the bottom of your to-do list? Believe me. I get it. Prioritizing your health in the day-to-day busyness of life can be really difficult. And because these changes made such an enormous impact on her personal life, she decided to compile all of her tips and strategies into a full-length 15-day course to help those of us who want to overhaul our health and grab ahold of that vibrant, healthy life we’re all dreaming of. 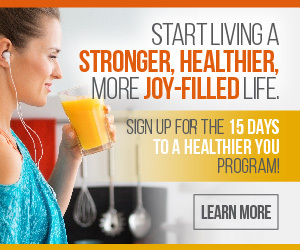 Get the help you need to live a stronger, healthier, more joy-filled life today by signing up for 15 Days to a Healthier You today! And guess what? To kick off the launch of the program, FOR TODAY ONLY (Wednesday, November 8) Crystal is offering the program for only $5 (that’s $0.33 per day!). Tomorrow (Thursday, November 9) the price goes up to $10 (that’s $0.67 per day). Finally, on Friday, November 10, the price goes to it’s regular price, $15. That’s only $1.00 a day which is still a great deal but why pay full price when you can pay only $5 buck? Personally, I loved the original version of the course and I am purchasing this version as well!